The pursuit for silence is sought after by many enthusiasts and meeting different demands, manufacturers have developed product-lines to satisfy these needs. In the computer chassis category there are products designed specifically with silence in mind. Likewise, in the arena of cooling there are also products designed for those with a leaning towards low-noise solutions but in all these cases there is usually a compromise. Silent computer cases generally feature closed off panels and thus can suffer by struggling to generate adequate airflow, but for CPU coolers the compromise for silence is usually temperatures and today’s review sample seeks to find an excellent balance between the two. Under the spotlight today is SilverStone’s newly released HE02 from the Heligon Series. HE02 is a large CPU cooler designed to be used passively inside a computer chassis. Although it doesn’t come with a cooling fan, it can entertain them, but the intention is to go without in a bid to achieve silence whilst delivering impressive temperature readings on a plethora of socket types. HE02 is even suitable for the demanding heights of Intel’s Sandy Bridge-E and this is something we will be taking a close look at today. The all new Heligon HE02 CPU cooler is designed for both performance and quietness. 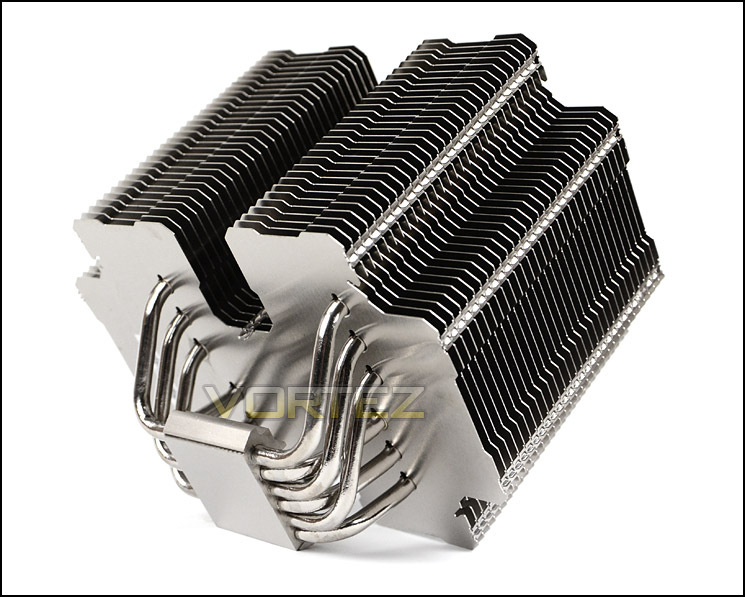 The wide aluminum fins spacing are specially designed to minimize noise when air travel through its heatsink. The double cross shape of the cooler maximizes cooling surface and at the same time makes installation an ease on any motherboard. The corners of the crosses enable motherboard mounting even after the cooler has been installed while inner corners between the two crosses are to facilitate installation of the cooler’s bracket onto the motherboard. The entire cooler is asymmetrically designed so it can be installed optimally in different motherboard and chassis. The Heligon HE02 is capable of safely cooling high-end CPUs such as the Intel Core i7 3960K without cooling fan directly attached. And using fans from the chassis it can also cool CPUs with TDP rating of up to 130W. Fan clips are included for optional 120mm fan mountings to enable HE02 to obtain cooling performance that rival the best air coolers on the market. For those looking to obtain the highest cooling performance at the lowest noise possible, the SilverStone Heligon HE02 is an unbeatable solution.